Finally kept up in the pool this evening. Didn't get lapped once. Dropping down a lane was a most excellent idea. 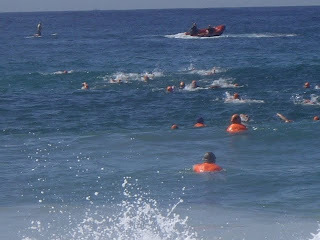 First actual ocean swim yesterday! Swam 1km without entirely drowning. Still couldn't get the breathing quite right in the first leg but it kind of came together in the second. Still find it all incredibly challenging but at least I know I'll last the distance. No sign of sharks. However still swam in time to the jaws theme song.